"From the time I was 3, 4, and 5 years old, I wore nothing but cowboy boots," said Jim Austin, owner of Rimrock Ranch in California. As a child, Austin, co-founder of surfwear company Redsand, felt connected to the cowboy aesthetic even though he was from the beaches of San Diego. "I always wanted to run away to the Old West," he said. So it seems only natural that as an adult, Austin would be drawn to Pioneertown, an Old West-style community in the Mojave Desert. The town was built by Roy Rogers, Gene Autry and investors to serve as a film set for Hollywood Westerns. "It just called to me," says Austin, a stand-up bass musician who used to visit the high desert to play music shows. He ultimately decided to buy Rimrock Ranch and its 31 acres in the town. The ranch was originally built in 1947 as a weekend getaway spot for actors filming in Pioneertown. The cabins are still for rent today, but the clientele has changed. 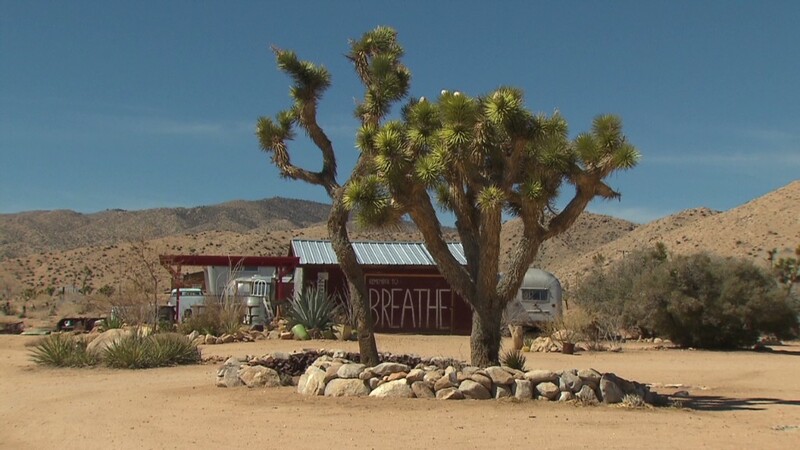 These days, artists, writers and musicians flock here for inspiration from the Joshua trees that dot the desert landscape. Austin lives on the ranch, although his own residence there is modern in design. Still, he's paying tribute to his childhood infatuation. Inside the home, he's got vintage cowboy art, a cowboy boot collection, and what he calls his "cowboy tub." "I finally ran away to the Old West," he said.